OMAHA STEAKS OFFER: $10 Off Orders Over $50 + $4.99 Shipping directly to you! Once again, Thanksgiving is upon us so it is time for us to extol one of Texas' finest contributions to American cuisine - cornbread dressing. 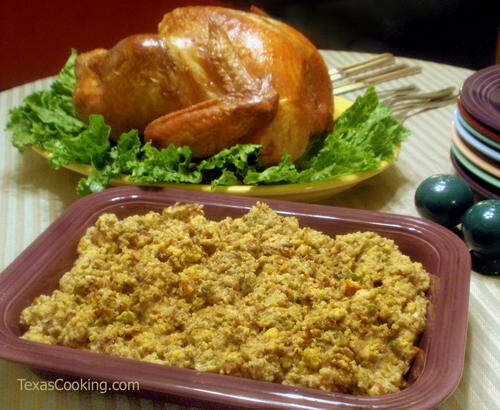 Done right, cornbread dressing is moist, not dry, and the perfect accompanyment to a holiday turkey. Don't be intimidated by the long list of ingredients and instructions. Just remember to make the cornbread the night before, and to leave a regular loaf of bread out in the open air as well. For the chicken stock, regular cans of Swanson's work fine. Be fearless and make the giblet gravy! The secret ingredient is sherry. Use dry sherry. It doesn't have to be from a bottle of anything fancy. If you want to read our previous Recipe of the Week newsletters, I have been making them available from a new page on our website. Look here! Enjoy this Texas Cooking recipe and have a great week! You are reading our Recipe of the Week newsletter. In 2018 our main monthly newsletter will feature brand new recipes that we add to the TexasCooking.com website. If you do not already receive our monthly newsletter, subscribe here. This old-fashioned cornbread dressing is flavorful, tender and moist. Not fancy, its ingredients are simple. Grandma didn't hold with the notion that the more stuff you put in cornbread dressing, the better it is. The heart of the dressing is the cornbread, and the following recipe produces a coarse-crumbed, flavorful base for the dressing. Serve this dressing as part of a complete dinner as detailed in Turkey and Most of the Trimmings. Put the bacon drippings in a 9x13-inch baking dish and put it in the oven while it is preheating. The drippings will melt while you're mixing up the batter. Beat the eggs in a medium bowl until frothy. Add the corn meal, salt, baking soda and baking powder, and stir to combine. Add the buttermilk and stir well. Remove the hot dish from the oven. Swirl the dish to coat it with melted bacon drippings, pour the bacon drippings into the batter and stir to combine. Make the cornbread a day before you intend to make your dressing. Leave it out, uncovered, overnight. Crumble the cornbread and white bread into a very large baking dish or pan (This is the pan you will cook your dressing in, and you need room to stir it while it's cooking). In a large skillet, sauté the celery, onion and green pepper in butter over medium heat until onion is transparent. Combine the sautéed vegetables with the bread crumbs and mix well. Note: The dressing up to this point can be prepared an hour or so in advance. When you are ready to bake the dressing, add the beaten eggs, chicken stock and turkey pan drippings, and stir. (You may need a little more chicken stock -- better if it's too moist than too dry; the uncooked dressing should be a little on the slushy side.) Add 2 teaspoons poultry seasoning, 1/2 teaspoon rubbed sage, black pepper, and mix thoroughly. After baking for 15 minutes or so, stir dressing down from the sides of the pan so that it cooks uniformly (my mother's term was "rake through it"). Check the seasonings; that is, taste it. If you don't taste enough sage for your liking, add 1/4 teaspoon or so with a little chicken stock, stir it in, and taste again. Careful, a little sage goes a long way. Total cooking time should be about 30 minutes. The Giblets: I use just the liver and pieces off the neck (I give the gizzard to the cat, and my husband eats the heart.) I always cook the neck with the turkey -- tuck it down in a corner of the pan. You can cook the liver the same way: submerge it in the broth in the roasting pan about 30 minutes before you expect the turkey to be done, or you can put it in a small saucepan, cover with a cup or so of lightly salted water and simmer it for 30 minutes. Since burner space is at a premium when preparing a holiday meal, I usually opt for the cook-it-with-the-turkey method. Reduce heat to low, and check the seasonings. Add salt and pepper only if you think it is necessary. Some people (me) like to add a tablespoon or two of sherry at this point. It makes a wonderful difference. Add the giblets and simmer for about 10 minutes. You can make your gravy early, keep it warm, and heat it back up a bit just before serving, if you like. Here are 10 things that caught my eye this week! Dessert recipes for Thanksgiving: Chocolate Fudge, Butterscotch Pie, Sweet Potato Praline Pie, and Texas Pecan Pie. Homesick Texan: Ten great meals from recent trips to Texas. Texas Monthly: Ronnie's BBQ in Johnson City. The Woks of Life: Chinese Vegetables: Leafy Greens. SA Food: 10 things to know about Wurstfest in New Braunfels, which starts on Friday. Sweet Life Blog: Tlayuda de Pollo, a popular street snack is given a time saving revamp. NYT Food: Know Your Squash! Saveur: Crumb Cake Is Germany's Gift to Baking - Try the classic and some variations, like chocolate-pistachio and cranberry-almond-oat. Serve food on colorful Fiesta dishes. See the newest colors: Mulberry. Manufactured in the USA!